Trim the fennel, then cut each bulb into 4-6 pieces lengthways. Bring a large pan of salted water to the boil, add the fennel and blanch for 5 minutes. Drain and leave until cool enough to handle. Meanwhile, melt the butter and add the garlic. 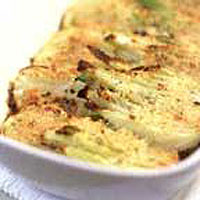 Arrange the fennel in a shallow, ovenproof dish , large enough to take it in a single layer. Season with pepper, pour over the garlic butter, and sprinkle over the Parmesan. Bake for 30 minutes until bubbling and golden. Serve hot. For 2 people, use 1 large or 2 small fennel bulbs, and a little less butter, garlic and Parmesan. To prepare ahead, blanch the fennel, arrange in the dish, prepare the Parmesan and garlic, then when ready to cook, melt the butter, add the garlic and sprinkle on the cheese.